Multimedia visual artist Jayel Draco grew up in New York City, where in 2003, he earned his BFA in Illustration from the School of Visual Arts, later branching out into animation, costume and prop design, photomanipulation, motion graphics, and VFX. During his time as a freelance artist, Jayel’s fashion designs have been featured at trade shows including Project and Pool, and his animation work has appeared in Marvel’s Astonishing X-Men (episodes 1 – 6, written by Joss Whedon, illustrated by John Cassaday, and directed by Neal Adams) at MarvelFest New York City, and in Wagner’s Die Walküre (conducted by James Levine and directed by Robert LePage) at the New York Metropolitan Opera. For several years, he worked under the close tutelage of renowned comic book artist Neal Adams. In 2014, Jayel teamed up with writer Lynsey G to found Oneshi Press, an independent publishing company dedicated to bringing immersive graphic storytelling projects to life. Today, Jayel lives and works in Missoula, Montana, where he can generally be found taking in nature, enjoying a beer from a local microbrew, and immersed in his artwork. 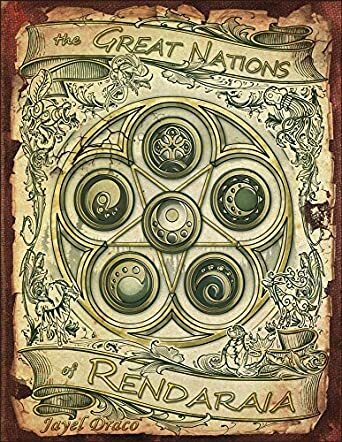 The Great Nations of Rendaraia is a scholastic account of the five great nations and their mysterious downfall. The first part briefly documents the history of Arilyness, Lithicus, Mithera, Danrock, and Noda. Each of these nations concentrates on a particular field of learning, from the spiritual knowledge of Mithera, to the architects of Danrock. This specialisation is only possible due to the Hodgeskeen, a nomadic nation that ties the five together through the trade opportunities and transport their air ships provide. One day the Hodgeskeen arrive at the capital of Mithera and find it in ruins, with no survivors and no clues as to who or what toppled the nation. The Great Nations fall one after the other, but nobody knows how until it’s too late. This book is a visual feast filled with detailed maps and stunning illustrations by author Jayel Draco. The narrative focuses more on the culture and origins of the great nations than the story of what happened to them, but this fits the book’s presentation as a scholar’s effort to preserve history. I love that the author included homosexual relationships and non-binary gendered characters. Rendaraia is one of the most fantastical worlds I’ve ever encountered. The only drawback I found is that the names of people and places are a little difficult to remember. The Great Nations of Rendaraia is the sort of book you tuck away with the most treasured novels in your library, removing it from the shelf every now and then simply to admire it.